It’s nearing that time again, when the holiday decorations have been put away and our resolutions are beginning to waver (no judgment! ), and the stores have become infested with all things red and pink. It’s the bane of those without romantic entanglement, sure, but whether you’re buying a life-sized stuffed teddy bear for that Special Someone or just indulging in the half-price candy on February 15, there’s no denying that Valentine’s Day is upon us once again. So sit back, pour yourself a nice Chianti and put on “The Ballad of Harry Warden” for a nice soundtrack; I’ve once again plundered the tombs of the independent artists and creators to bring you the finest in spooky wares! As a mom of a toddler, one of the most daunting tasks this time of year can be finding the perfect card. Do you go for the “Paw Patrol” ones with temporary tattoos or the “Spongebob” ones with those chalky candy hearts? If you’re like me, you’re staring at the endless rows of Hallmark cards wondering exactly which one expresses how you feel about the people you love, reading all of that sappy poetry and wondering if it’s just right. Well, look no further. Artist Marty McEwan of One Man Riet has you covered for all of the perfect loveydovey cards you could need. From Hannibal Lecter, Elvira and Freddy Krueger to The Zodiac Killer, Predator and Chucky, many of the most iconic horror heartthrobs are represented in an adorable vintage style with some very funny (and often X-rated) phrasing. The cards are sold in pre-sorted packages (no mix and match option, unfortunately), but for $20 you get a set of seven fantastic, original pieces suitable for framing or giving out to your loved ones. When the cartoon hearts just won’t do, anatomical is of course the way to go, and everyone knows the way to a significant other’s heart is through their ribcage. Paranormal Bathtivity has beautiful heart-shaped soaps made of the gentlest, most moisturizing ingredients (like goat’s milk and coconut oil!) and dyed with tub-safe dyes to create incredibly fragrant, pigmented baths that will definitely leave you feeling fresher than a graverobber. They have lots of great bath products as well, and an awesome shop name, and purchases come in adorable casket-shaped gift boxes loaded with black crinkle tissue paper and other spooky little accoutrements; as we all know, the devil is in the details! Everyone knows the story of Krampus and that he is the darker totem of the holidays, but not everyone may know he’s also known for stealing hearts on Valentine’s Day! Kitsch Candles has created amazing hand-poured soy candles with a gorgeous smoky vanilla scent (or a warm, cozy bonfire smell if you prefer; there are two options available!) and great artwork featuring Krampus doing exactly that. Why wait until the Yule to celebrate our favorite hoofed holiday visitor? Snag one of these limited-run candles; they smell awesome and bring the perfect ambiance to the room. While the phrase “Netflix and chill” may be a relatively new meme, horror fans in the dating world know the truth; if you haven’t tried to put moves on someone during ‘Cannibal Holocaust’, have you even dated a horror fan? It can be a little distracting, to be sure, to have your game face on when these movies have taught us that getting frisky may mean being nailed to your partner forever with a harpoon gun. But if you ARE planning on building that romantic atmosphere on the big night, lighting is one of the key factors in setting a mood. And what better way to light your domain than with a retro VHS-inspired nightlight? My fabulous fiancé Freddy and I got a pair of these for our Christmas presents (‘Jaws’ for me, ‘Star Wars’ for him) and we love them. The LED lights inside put off a bright, color-coordinated glow with the label art, and they run off a small battery pack attached to the back so you can literally put them anywhere in a room without worrying about plugs or cords. They weigh almost nothing and come in dozens of styles and labels. They do ship from the UK so give yourself a little lead time if you’re buying one as a gift, but I honestly love these and they’re a great conversation piece in our movie room where we display our memorabilia and collectibles. Many of them are hand-painted or adorned with extra detail as well (there is a ‘The Thing’ one with tentacles sprouting from it!) if you want to go the extra mile! If you’re into massages, whether it’s yourself or someone else, our buddy Leatherface will be the first one to tell you the importance of moisturizing the skin! Greywick Lane has you covered with this Halloween-themed body butter which smells exactly like sticking your head in an overflowing candy pail and sniffing deep. Tart pumpkin candy, salted caramel, sticky-sweet treats, and just a hint of autumn spice, and it goes on creamy, non-greasy and soft. You’ll be ready to make a skin suit worthy of Buffalo Bill in no time if you keep up a beauty routine involving products like this, and who can resist the adorable label art with everyone’s favorite Beistle-inspired classic black kitty? 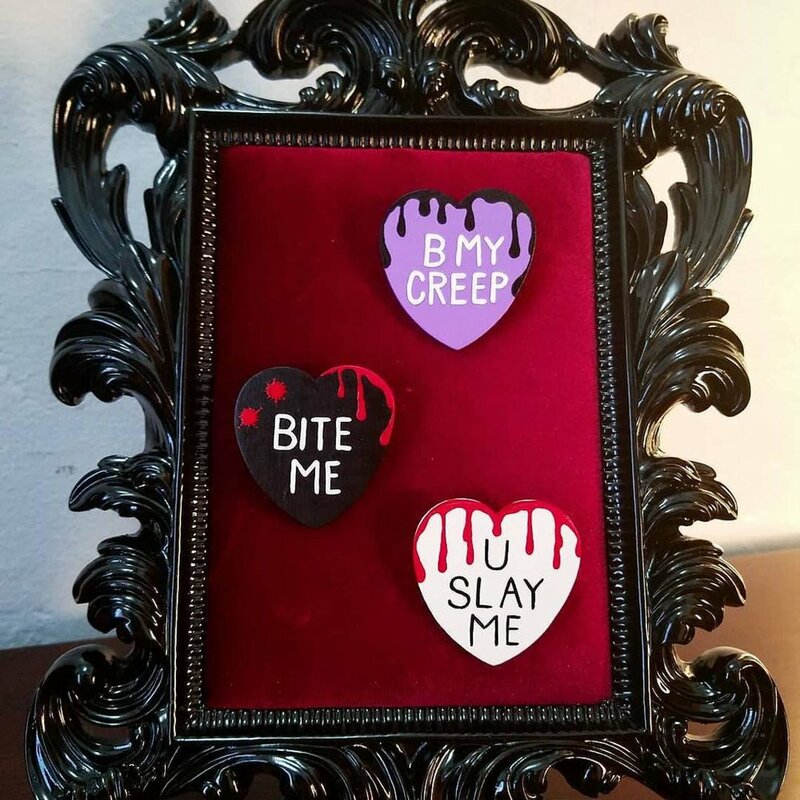 While on the subject of jewelry (and conversation hearts), Little Black Bats make some of the cutest necklaces and earrings out there, with a special attention to horror and nerd fandoms. Acrylic and shrinky-dink styled pieces featuring all of the horror icons as well as some more awesome obscurities (ever needed a ‘Scary Stories to Tell in the Dark’ necklace, or a ‘Goosebumps’ Christmas ornament?) finish off any sweetheart’s look. LBB has launched a line of pastel-colored candy heart necklaces, either ready-to-ship (and featuring some rather risqué, hilarious phrases) or a custom listing where you’re encouraged to put your own spin on a classic. You’re only limited by your imagination and the character spaces! LBB also offers free shipping within the US and a quick turnaround time, which only makes her amazing low prices even more awesome. 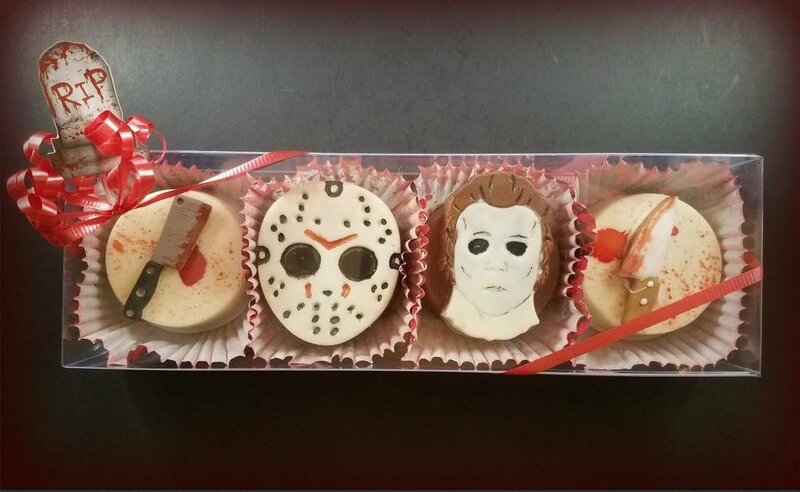 And finally, for those with a sweet tooth, JJ’s Chocolates have designed some incredible chocolate-covered cookies decorated with all your favorite maniacs. These cookies come from New Jersey and are made with lots of love; not only are they DELICIOUS (the one I sampled literally melted in my mouth and was divine), the attention and care put into the décor ensures your cookies will arrive looking flawless. These are awesome displayed on a plate and will be the talk of any V-Day party; who can resist a bite? 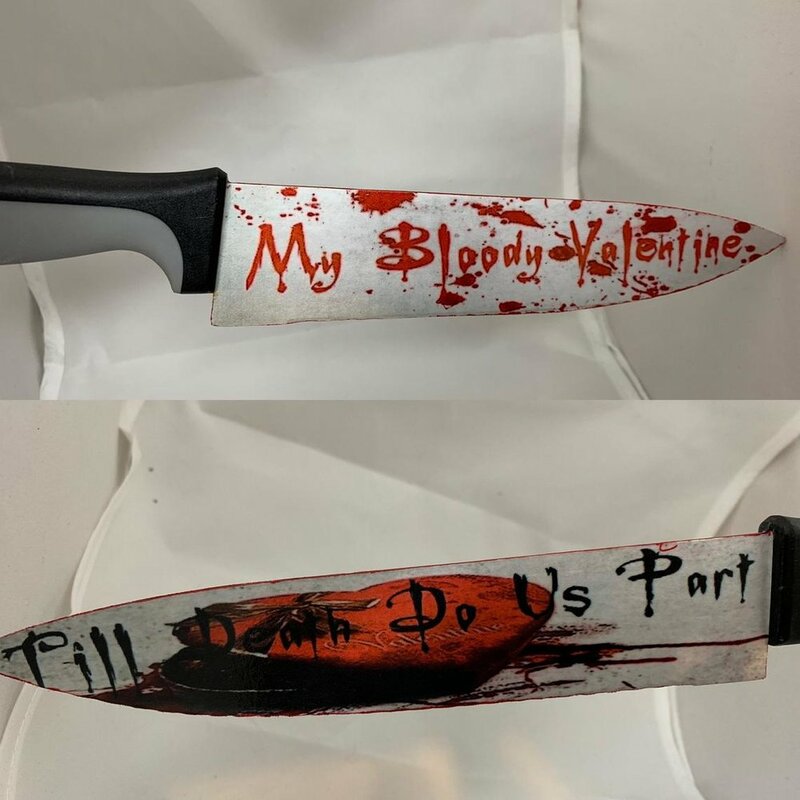 So whether you’re spending the holiday in a coffin for two or enjoying a more solitary existence, there are plenty of great treats and fun items you can enjoy to make your Valentine’s Day a special occasion. Light a spooky candle, watch some hormone-charged teens get what’s coming to them, and as my dear friend Black Phillip might say on this ‘heart’-iest of holidays… “Love deliciously!” Until next time, my creepy kindred.